Summer is season of watermelon in Japan. My son's grand mother gave his grandchildren this watermelon. My younger son was really happy to get watermelon. He loves watermelons. When we went to supermarket, he rally wanted it. But it was expensive yet. Younger watermelons are expensive. July is nice month to get watermelon in Japan. By the way, summer is very hot and humid in Japan. Usually I suffer from the summer heat. And I can eat only cool and light foods which like watermelons and cold noodles. I think there are several types of noodles in Japan. Tess wrote on her blog. It is "Udon". Evert year Japanese schools have sports day. Last Saturday, it was the sports day. I just watched it. But I was very tired... Next day I could't get up..
My younger son ran in a running race. But his shoe was gotten off. And he jump on his one foot. He was afraid of dirty his socks. I should have told that if his shoes get off, you run! I found a guy who was very terrible behavior in the steam engine's front of special car when we enjoyed to get on it. I found a guy who was very terrible behavior in the front of special car. He didn't close a window, although smoke went up the car. And he lay down on a sofa in public. The thing I couldn't stand he didn't give up his sofa. The thing I couldn't stand are people who didn't think about the other people in public. The other passenger complained of the guy's behavior. " Please close the window." But the guy ignored it. I think he is adult. He should have been gentleman for kids. Sometimes train's OTAKU can't understand their situation. We got on a sleeping car again. Now when pepole take a trip in Japan, they usually use planes or bullet trains. (Off course we use car too.) Because planes are faster than sleeping cars. Therefore sleeping cars become to disappear on rails. Next year this sleeping trains will stop. Therefore before stopping this train we planed to get on it. Strange to say this sleeping cars getting really trendy. We slept in a nice room which is a little retro. Next time we want to write facilities in this room. We Japanese travel by train, we eat Ekiben on trains. "Eki" means station. "ben" means lunch box. I think ekiben are a part of Japanese culture. And eating ekiben on trains is the Japanese way of traveling by trains. If you travel by trains in Japan, you should try ekiben. You can get many kinds of ekiben. Any stations have any bento. We enjoyed to get on a steam engine. We don't get on packed trains everyday. I wrote abut a Ecologically-friendly car. So my uncle sent this picture for me. 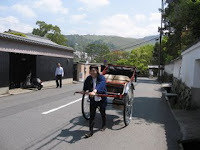 He lives in Nara, which is very historical city. I have ever seen this in our town whose roads are very busy. "I don't know if I could ride in one of those. I'd feel guilty about making somebody haul me around. Even if I was paying him to do it." But if we go to some sightseeing areas in Japan, you are asked to ride it. For me we have ever ridden it. I think it is a little expensive. We just walk by ourself.